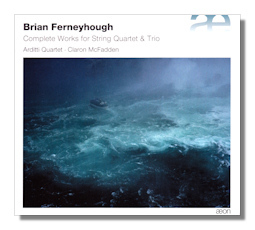 This is a splendid collection of the dozen or so most important works for chamber strings by British composer, Brian Ferneyhough, who was born in 1943. Belgian label outhere's æon is to be congratulated for conceiving this project, and seeing it through so well. It's a co-production with Südwestrundfunk (the German radio network based in Cologne) and æon; the performances come from a variety of sources, recordings and venues dating from between 2006 and 2012. The composition dates of the music range evenly between 1967 (the Sonatas) and 2010 (the Sixth Quartet), although the composer completed or published no such works in the 1970s. The music here is sequenced on the three CDs in strictly chronological order. This has the advantage, of course, of exposing how Ferneyhough's thought and achievement in the medium (string quartet, string trio) have matured. It also shows the variety of his inventiveness. It's hard to miss a consistency, a conscious development, almost, in the composer's engagement with the medium. As if he has been telling a story; revisiting an idea; developing, refining and elaborating a theme. It's harder, though, to discern how different this major area of Ferneyhough's music would have been had it not been either written specifically for (members of) the Arditti Quartet – probably the world's leading performers of the contemporary string quartet (and trio etc), or written with them in mind. And this is one of the great strengths of this set where the Ardittis perform everything. Not only are the musicians totally at home in the works, able to respond with a gentle force to that progression of ideas, sounds and musical outcomes, are happy to bring just what is needed to the medium. But they never allow themselves to suggest in any way that their interpretations are in special, privileged, exclusive. Rather, the playing is focused, tight, adept at navigating the many worlds that Ferneyhough's sometimes sinewy and taut composition excels in building. It's all music that celebrates strings; from evocative unison arco writing graceful and almost "domestic" to aggressive and disconcerting pizzicato – sometimes in proximity, as in the Sonatas' "Rho" and "Sigma" [CD.1 tr.s 17,18], for instance, and the spellbinding Exordium [CD.3 tr.6]. In his accompanying note, Irvine Arditti comments that no single project in the Ardittis' 40 year history has been so large as this. You certainly get the feeling that they've thrown themselves into it with alacrity and affection. You're also aware that the players feel no mandate to treat Ferneyhough's eleven completed pieces (this set includes Adagissimo [CD.1. tr.26], Dum transisset I-IV [CD.3 tr.s 2-4], and Exordium [CD.3 tr.6] as well as the two named Trios and six Quartets) as examples of the genre. Rather, they're exciting and progressive works in their own rights. Particularly pleasing with such a span of music for largely the same combination of sound possibilities is the way that the players capture Ferneyhough's excitement; they make you wonder what's coming next; how Ferneyhough plans to build what he does. To help achieve this command over the music the Ardittis' playing directs much attention to the individual aspects of the compositions… pauses, attack, sound production (such as glissandi, portamento and – above all, it seems at times – staccato). Few listeners would probably describe Ferneyhough's string quartet and trio writing as lyrically passive and dreamy. But the Ardittis' experience is such that they pull the greatest expression and consistency out of the composer's intense and apparently fragmented style. To listen, for instance, to the two-movement Third String Quartet [CD.2 tr.s 1,2] or the cast iron logic of the Fourth [CD.2 tr.s 3-6] is to hear compositions built meticulously from bar to bar (there are huge variations in both texture and tempo, for example). But they are compositions whose overall conceptions arise from vision and insight; never shock and effect – however dislocated some of the phrasing of Ferneyhough's work may sound on casual (or) first hearing. Another achievement of the Ardittis here is to expose the maturation process of Ferneyhough's work in the genre over 40+ years without even slightly implicitly underplaying value of the earlier works, especially given what seems like their ever-increasing energy. This may even be because, by the time you've followed Ferneyhough's journey in the medium a couple of times, you're aware of his growing maturation, which puts a certain distance between him and a somewhat complex impetus. A relaxation, almost. That the Ardittis have nevertheless given each work its due for its own sake and on its own terms is to their credit. Ferneyhough has always been concerned with the (human) voice. American soprano Claron McFadden performs with vigor and enthusiasm in the Fourth String Quartet [CD.2 tr.s 3-6]; she makes up with energy a perhaps less than idiomatic pronunciation of the non-English texts. A lot is expected of her in terms of vocal dexterity and speedy articulation: McFadden delivers here very well indeed. Importantly, this combination of players and singers underlines once more Ferneyhough's attraction, connection and even indebtedness with and to the earlier exponents in this (string) medium; and indeed the widest canon of Western music. Dum Transisset, for example, is based on material by Christopher Tye (c. 1505-1573). Again, this is a difficult blend for the Ardittis to have achieved: uncompromisingly contemporary music which makes few concessions to conventional tonality or even expected structure. Yet the listener soon knows that everything which Ferneyhough says has its origins in recognizable precedents of logic and progression. The nett result of this tension is that the performers successfully take us well below the surface. This facility not merely to "play" the music impassively, nor to unfold it without "paying it out" like rope from a drum. That strength is particularly evident when the forces are reduced even further to the intensity of just the violin, viola and cello of the short Streichtrio from 1994; then the much longer String Trio. Indeed the latter is the longest work on the set… only the Sixth Quartet is so substantial as a single movement. Ferneyhough is conscious that this medium has origins (the trio sonata) which contrast with the more widely adopted and developed Classical sonata-allegro form. The Ardittis are conscious of the consequent need neither to let the composer's concerns with form and structure overwhelm the works' musicality; nor let form and structure become incidental; that would thus have risked a loss of impact in what – as has been said – may seem an already fragmented sonic world. Their drive and understanding of the composer's priorities succeed admirably here too. At the same time, the transcendence and concern for the mystical is never lost as the particularities of technique and continuity of vastly varying phrases are attended to. By the time you've absorbed and become more familiar with the apparently even more ambitious Sixth Quartet, the large(r) scale on which it was conceived and written will surely strike you as an apotheosis (at least for Ferneyhough) of the amalgam of the fragment and the whole. This structural element is also admirably conveyed by the Ardittis. The acoustics of the locations (Hans Rosbaud-Studio, Baden Baden; the Beethovenhaus in Bonn) in which these recordings were made provide resonant but not luxuriant atmospheres in which this insistent and definite music is heard at its best. The booklet in French and English has useful background on the works – by Ferneyhough himself, and by his pupil, Fabrice Fitch. Ferneyhough's Sixth Quartet is also available on Neos 1114 ("Donaueschinger Musiktage 2010"); otherwise these are the only available recordings of the works. It's hard to imagine anyone better suited to their interpretation than the Ardittis. This is a set that should be snapped up by all those interested in and/or enthusiastic about contemporary music. Ferneyhough has a rare blend of authority and invention. His music deserves a wider audience. This excellent collection should help to achieve that.